The Arctic Circle is an invisible ring on Earth, encompassing the Arctic region. The Arctic Circle lines the boundary of an area where the sun does not set on some days in summer (an Arctic phenomenon called the midnight sun) and does not rise in winter (which is called the polar nights). The center of the Arctic Circle is the North Pole, which makes the Arctic Circle the region of the Northern Hemisphere surrounding the North Pole. The Arctic Circle is also one of the five major named circles of latitude on the globe. 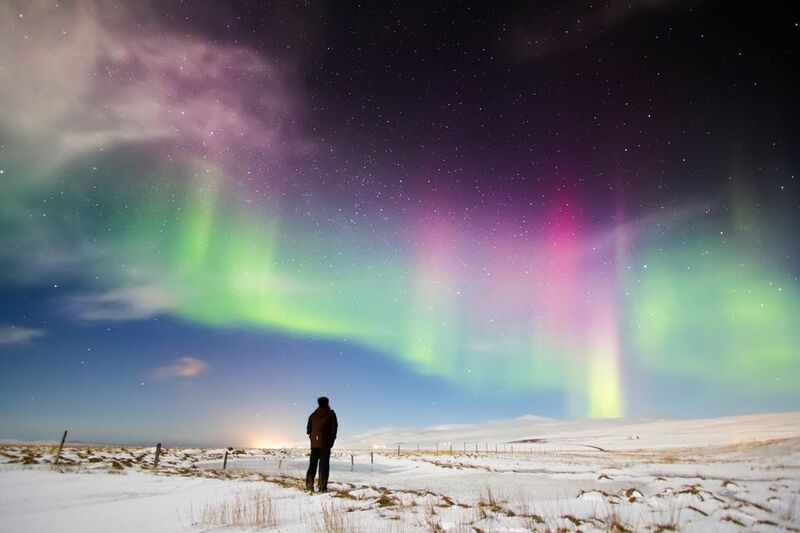 Scandinavia puts on quite a show of three natural phenomena which occur year-round inside the Arctic Circle. This includes the northern lights, the midnight sun, and the polar nights. Travel to the Arctic Circle takes you past the boundary of an area in which the sun does not set on some days in summer and does not rise on some days in winter. So where is the Arctic Circle, anyway? The location of the Arctic Circle changes slightly at all times due to the planet's movements. The center of the Arctic Circle is the North Pole, and the line of the circle itself is about 1,650 miles south of the North Pole. Calculated from the middle of the planet, the Arctic Circle is located exactly 66° 33′39″ north of the Equator. Guy Lebegue - CC Lic. Travel to the Arctic Circle and you'll have a once-in-a-lifetime travel experience. Where exactly should you travel past the Arctic Circle? There are several options. The two most famous destinations for travelers in the Arctic Circle is the North Cape and Spitsbergen. Spitsbergen is a Norwegian island far north in the Arctic Ocean and past the Arctic Circle. In Norway, you can find the line of the Arctic Circle 50 miles north of Mo i Rana, and 43 miles south of Fauske. From May through the beginning of October, you can also visit the famous Arctic Circle Centre by traveling on the E6 highway and exiting at the town of Saltfjellet. Iceland is close to the Arctic Circle and traveling here is easy. The Icelandic island of Grimsey is situated directly on the Arctic Circle. Your Arctic Circle travel plans should definitely include one of the ice hotels in Scandinavia if you are traveling during the winter months. Each hotel differs widely from the next and is sure to give your Arctic Circle travel itinerary a special flair. Arctic cruises are one of the easiest and safest options to travel inside the Arctic Circle. Today's arctic cruises are no longer the dangerous voyage they once were, and such cruises have become quite popular among travelers. A cruise to the Arctic can definitely be a once-in-a-lifetime trip. You can start looking for an Arctic cruise on Expedia.com, which compares several different cruise offers and tours. Make sure to check "Arctic/Antarctic" as the region for your cruise. You can sort by cruise length, price, and more. Cruisedirect.com lists several cruises into the Arctic region. Many originate and focus on cruise ports in Scandinavia, but there are also quite a few cruises that travel to the Arctic region from Alaska and Canada. The prices from various cruise lines listed on the site are very competitive, and the cruises are easy to book. There are several guided boat tours and short Arctic cruises available among guided tours in Lapland, Finland. For Arctic traveler looking for something more, consider Polar Cruises. This company offers luxury-level Arctic cruises that last up to two ​weeks but also cost quite a bit more than the suggestions above. An Arctic expedition is great for the more adventurous traveler, but that doesn't mean you have to leave the kids at home. Intrepid Travel is a worldwide travel organizer offering family-friendly group tours to the world's less traveled and more exciting destinations, including the Arctic Circle. Make sure to check out their tours available in Northern Finland, Greenland, and Iceland. Isango! also offers several well-priced guided tours that safely lead past the Arctic Circle and into the Arctic region. Other expeditions in the Arctic Circle are available for travelers by National Geographic, but they can be a bit pricey. If you prefer to join a truly scientific expedition, your best bet will be to contact the organization of your choice or the National Science Foundation. However, many organizations are not open to travelers joining their scientific expeditions. Keep in mind that in the Arctic, guided tours in Lapland are shorter and more easy-going if an Arctic expedition is too long or too exhausting to consider. About 90 percent of the Arctic has little snow and ice during the summer. As a matter of fact, many kinds of shrubs and plants grow here, but they remain lower to the ground. The ​North Cape is known as the northernmost point of Europe. The North Pole is usually not the coldest location in the Arctic. The Arctic Circle is approximately 1,650 miles from the North Pole. In 2011, Neanderthal remains found near the Arctic Circle have been dated at more than 28,500 years old, which is more than 8,000 years after Neanderthals are thought to have disappeared. While the sun doesn't rise much during the winter, it does shine every day on the entire Arctic Circle in the summer months. Lands along the Arctic include those of Alaska, Canada, Greenland/Denmark, Iceland, Norway, Sweden, Finland, and Russia. The Arctic Circle is located exactly 66° 33′39″ north of the Equator. A popular question is: which three continents the Arctic Ocean touches. So which of the continents does this ocean border? The Arctic Ocean touches the continents of North America, Europe, and Asia. The Arctic Ocean is the smallest of the world's five major oceans and has two important waterways (albeit seasonal, due to ice): The Northwest Passage (United States and Canada) and Northern Sea Route (Norway and Russia). The thinning polar ice in the Arctic Ocean in the past 10-20 years is enabling the Arctic Ocean to become a more and more important waterway for shipping and trade. Most of the Arctic Ocean is located beyond the Arctic Circle. The ocean spans 14.056 million square kilometers. Canada and the United States share the Beaufort Sea and survey the Arctic continental shelf together. Denmark (Greenland) and Norway have made submissions to the Commission on the Limits of the Continental Shelf (CLCS) under the Arctic Ocean. Meanwhile, Norway and Russia signed a comprehensive maritime boundary agreement in 2010 pertaining to the Barents Sea.